The Good Trade's Week of Outfits Series highlights women that have personally inspired us to shop and live with intention! Each woman takes her own unique approach slow fashion and demonstrates how beautifully sustainable fashion can come to life. 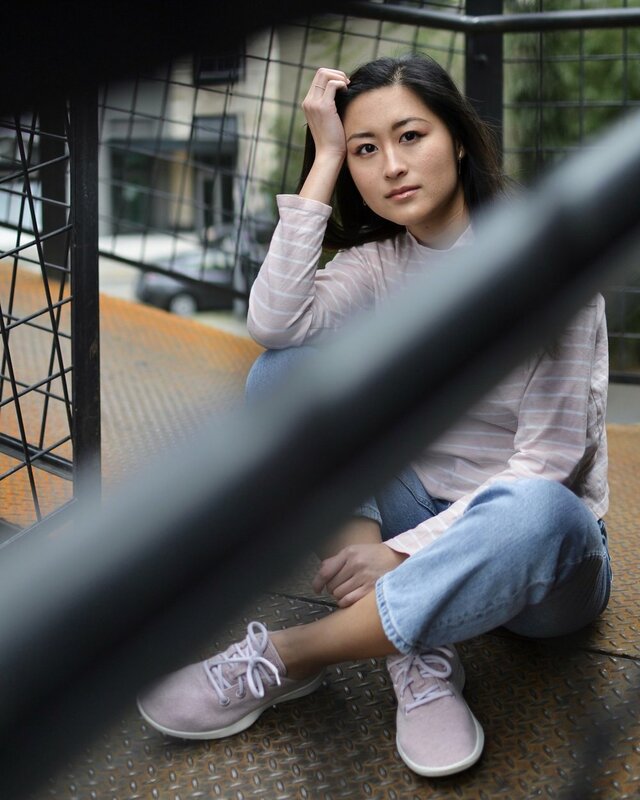 Today we're excited to share a week of outfits from Cat Chiang, the conscious blogger behind Restitchstance! Favorite Brand | Right now, I’ve been obsessing over First Rite’s Spring 2018 collection! I began my blog about a year ago, in March 2017. I wanted to blog about fashion, but I was aware of the ethical and environmental issues of the fashion industry and didn’t want to contribute to the exploitation of garment workers and our natural resources, so I began documenting my foray into sustainable and ethical fashion. My concern with the ethical and environmental issues of fast fashion is an extension of my personal values. I can’t call myself a feminist if I promote fashion companies that exploit low-income women of color, which most garment workers are. As I’ve learned more about sustainability, I’ve also come to prioritize the environment as a top concern because it’s most often low-income communities of color that are first affected by environmental damage. I began exploring ways to appreciate fashion sustainably and ethically, including shopping secondhand, discovering sustainable and ethical brands, and making my own clothes. I’ve always loved trying to DIY my own clothes (that was how I first got into fashion blogs) so it’s really cool to see this passion in my life come full circle as I’m learning to make my own clothes, and sometimes documenting my experiences on my own blog! It’s been empowering to reclaim the domestic skills of making clothes, because I’m doing so to fight fast fashion and gain an appreciation for the artistry and labor of the hands that have touched my clothes. I love that something that has constrained women for centuries can now be empowering and feminist, and I love that slow fashion and ethical fashion makes garment-making empowering for all women involved. I honestly wear the most casual outfits to work because I work at a tech startup, but if I wanted to dress up for a professional look, I’d wear this! I’m in love with this silk blouse from Frances Austen (the bow ties in front or back for versatility); it makes me feel totally put together and feminine but not too girly. I paired it with these culottes (a relic from my fast fashion past) and kitten heels from M.Gemi. Even though it’s officially spring, there’s still a chill in the air and I’ve still been wearing some winter outfits. My winter uniform has been some variation of this look: a cozy sweater, high-waisted skirt, and over-the-knee boots. Secretly, I mostly wear these boots because they keep my legs so warm. I bought them before I switched to sustainable and ethical fashion but I’ve gotten plenty of wear out of them. This cashmere sweater from Grana keeps me super warm without bulk. I DIYed the skirt with my novice sewing skills and scrap fabric—I’m pretty proud because it is my third project ever and from far away, you can’t see that my seams are horrifically crooked. For a casual yet Insta-worthy look, I love pairing a silk tank with high-waisted mom jeans. I thrifted this tank in a perfect peach hue from the lingerie section (ALWAYS check the lingerie section!) and this faux suede jacket that gives me retro vibes. The creamy off-white of my Nisolo slides ties the look together. This is probably the most “Cat” outfit in this post: a thrifted floral blouse tied at the waist paired with worn-in jeans and a funky thrifted jacket thrown on top. I live in variations of this look (because I have way too many thrifted floral blouses). Also, if you ever go thrifting with me, just pull me away from the floral blouses…please. I love how adding small accessories, like this cute “feminist” pin, adds personality to my outfit. And I lived in this alpaca cowl all winter; it knit up quickly and is ridiculously soft (alpaca is not only more sustainable than wool or cashmere, but softer!). This is pretty much what I actually wear when I’m not dressing up for any occasion, just going to work or running errands. It prioritizes comfort over all else, but the pastel pink is so perfect for spring. 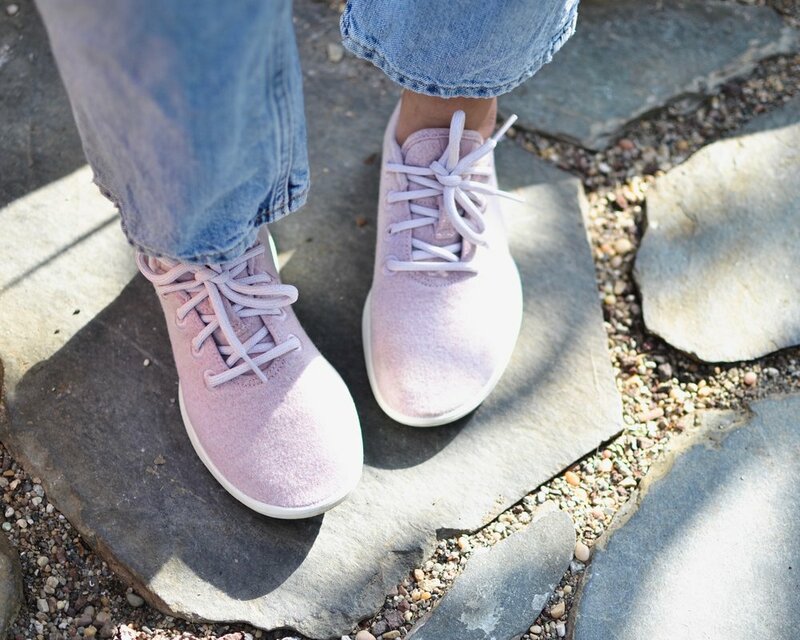 I’m in love with my Allbirds (reviewed on my blog here), because they’re made from natural materials and feel like walking on clouds!